PARIS (AP) — Ryder Cup organizers say they will support “for as long as necessary” the spectator who was hit by a tee shot and has reportedly lost sight in her right eye. 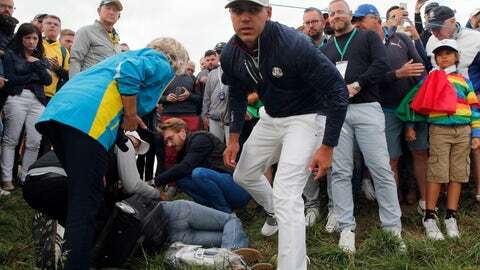 The injured spectator, who has been identified as 49-year-old Corine Remande in French press, was hospitalized after being hit on the head by an errant drive from Brooks Koepka on the sixth hole at Le Golf National last Friday. She’s reportedly said she is considering legal action after doctors told her she lost vision in her eye. The European Tour said in a statement on Tuesday: “We have been in communication with the family involved, starting with the immediate on-course treatment and thereafter to provide support, helping with the logistics of repatriation, including providing a transfer for the family from Paris to Lyon. We will continue to offer support for as long as necessary. According to reports in French media, Remande also blamed Ryder Cup organizers for the lack of protection on the course. She said a course official did not shout when he noticed the ball was headed toward the crowd.